You are looking at the archived 2015 toilet paper ratings. For the latest ratings information, see the current toilet paper ratings. Soft, yet resilient – cheap, yet indispensable. We ask Aussie shoppers to rate their levels of satisfaction with one of their most important household purchases: toilet paper. 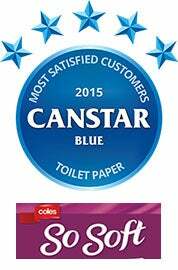 Canstar Blue research finalised in July 2015, published in August 2015. There are a few things in life that we mere mortals just can’t do without – food, water, sunlight, our mobile phones… and toilet paper. We may not spend a huge amount of money on it, but toilet paper is one of the home’s unsung heroes. It’s there for accidental spillages, to squish bugs, to blow your noise and to wipe your… you know. Now, there’s nothing we can do to help you efficiently manage your toilet paper consumption, but what we can do is offer a guide to how other consumers rate their brand of choice. Think your bum deserves better? Sick of running out of toilet paper too quickly? Here, we get to the ‘bottom’ of the story and can tell you that, for 2015, our Most Satisfied Customers Award for toilet paper has gone to Coles for its So Soft brand. Beating so many big name brands – as well as its supermarket private label competitors – is a great achievement for Coles at a time when the big chains are battling it out for market share – and to keep every customer. What do we want from toilet paper? Any toilet paper worth its salt will be there to fulfill its most basic requirements (insert mental image there) but most consumers want a bit more than that. They want a safe pair of hands – in the event of one of the aforementioned scenarios –and of course they want it to be soft and caring to their delicate region, as emphasised by our survey findings. How do we choose toilet paper? That’s an interesting outcome when you consider that the feel of toilet paper is the biggest driver of overall customer satisfaction. So to keep us coming back for more, it appears the brand that strikes the perfect balance between softness and value for money is onto a winner. This year, we congratulate Coles for achieving exactly that. Canstar Blue commissions Colmar Brunton to regularly survey 3,000 Australian consumers across a range of categories to measure and track customer satisfaction. The outcomes reported are the results from customers within the survey group who have purchased and used toilet paper in the last three months – in this case, 2,437 people. Coles So Soft is sold exclusively at Coles stores and you’ll usually find it in packs of 12 or 24. In fact it was the only brand to score a five-star rating for packaging, as well as for the ‘feel of toilet paper’ and overall satisfaction. ALDI’s private label Confidence toilet paper brand will usually be found in packs of 8 and, you guessed it, it’s only available at ALDI. It was the only brand to score a five-star rating for value for money. Planet Ark-endorsed, Safe toilet paper is claimed to be environmentally responsible. You’ll find it at most Coles and Woolworths stores. Purex toilet paper can be purchased at most Coles and Woolworths stores. It claims to be “strong on softness, longer on the roll”. Emporia promises “ultra-silky softness” from its toilet paper, which can be found at Coles and Woolworths. One of the biggest brands in the game, Kleenex has a wide range of toilet paper products, which you’ll find at most supermarkets. An environmentally friendly toilet paper brand, Naturale is Australian-owned and made from recycled tissue. Sorbent toilet paper comes in various packaging sizes, which can be purchased at most Coles, Woolworths and IGA stores. Woolworths Select toilet paper is Woolworths’ premium private label brand, which will usually be found in packs of 24 and is exclusive to the supermarket chain. Woolworths’ homebrand toilet paper is a cheaper alternative to its Select products. Again it’s only available at Woolworths. Similar to Woolworths’ Homebrand toilet paper, Coles Smart Buy is a cheaper version of its premium private label product. It is, of course, only available at Coles.